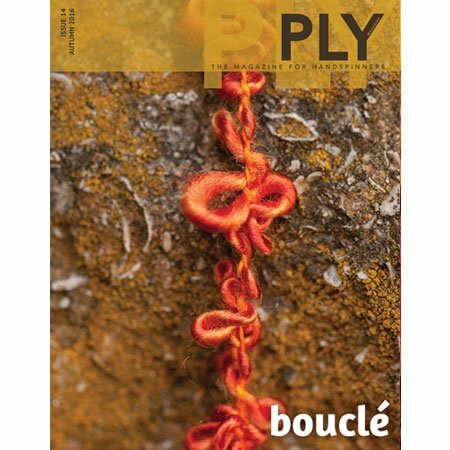 A small, independent magazine has the luxury of indulging itself every once in a while, so we did an entire issue devoted to that glorious, loopy yarn – boucle! Don’t worry, you’ll still learn tons about spinning but it’ll be through the boucle lens. This issue is filled with every kind of boucle you can think of but it’s not just about how to construct this exciting, lively yarn — it’s about spinning. Boucle (every yarn structure, actually) has so much to teach us if we just look. How different fibers and then how different breeds deal with being looped tells us so much about those fibers and breeds. Why do some fibers shine and some stall? Why does some fiber preparations work well while others fall short? Those are big spinning questions, and knowing the answers make us all better spinners. Start with the article about the convoluted history of the technique and then delve into all the various ways you can make a boucle (including faux, on a spindle, 2-step, and just by washing your yarn). Then take a look at what happens when you try to make a boucle out of long wool, short wool, medium wool, down wool, hemp, silk etc., you’ll be amazed! There is a lot of experimenting in this issue and it’s fascinating and informing. It’s also a gorgeous issue with a couple projects that will make you want to spin circles immediately!